Well, let's face it. 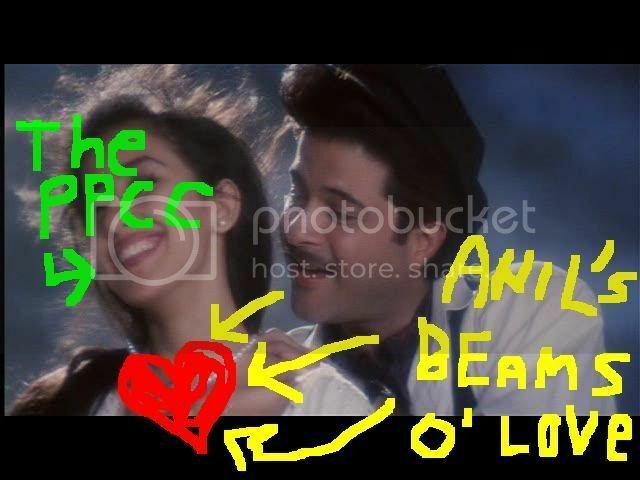 It's a party in the PPCC's heart and only Anil Kapoor is invited. Actually, scratch that - Pran, you can come too. And Madhuri, of course. But all you other folk - you Radioheads, you Shashi Kapoors, you pizzas, you family members - can get out. Sorry, there's just no more space for you anymore. Maybe if you grow a mustache and go, "Ah-hyuk, HAH HEYYYY!!!" we'll let you in purely on novelty value (a pizza in a mustache? ), but if you're not willing to compromise your individuality in the name of His Stacheliness then it's the road for you! See ya, wouldn't wanna BE YA. Some of you loyal readers might marvel that, between the known flop Trimurti and the known super-hit 1942: A Love Story, we chose to watch and review Trimurti first. But that's just how we roll. We'd much rather watch something that flopped and find it's a hidden gem for the PPCC than (1) just confirm that, yes, the super-hit classic really is good (booooring), or, even worse, (2) we don't think the super-hit classic is any great shakes (perish the thought!). (Too bad Trimurti really was bad...) And then there's the usual problem: what can we say about 1942: A Love Story that hasn't already been said? And said? And said? Well, if some of you are coming here from a certain science fiction magazine today, then allow the PPCC to make some wild assumptions about your demographic: white? American? unfamiliar with Bollywood? maybe you just watched a certain little film win Best Picture at the Golden Globes last night? Then stick around, because this may be the only way the PPCC can contribute anything of value in our review of 1942. We can say, behold!, Bollywood virgin, that sleazy game show host from Slumdog Millionaire is a lot more famous in India for this (aaand this) than some flashy yet likable quasi-Orientalist super-hyped glittering bauble that wins like ten gazillion unexpected awards. Ta da! One of the film's many iconic moments. 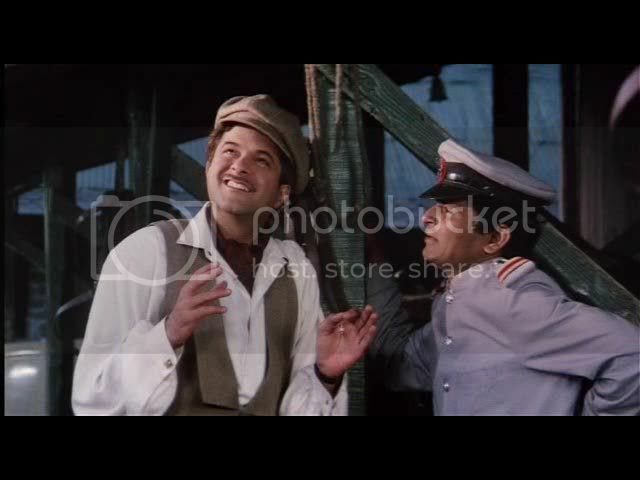 A rare historical romance, 1942's lovers are the bouncy, bourgeois Naren (Anil Kapoor) and the kind-hearted Rajeshwari (Manisha Koirala). He is a pampered, upbeat muppet whose father (Manohar Singh) is an evil collaborator with the British Raj, while she is a quiet working class girl whose father (Anupam Kher) is an underground revolutionary. The lovers meet via a couple coincidences and Naren's local amateur theater director, played by - wait for it, wait for it - we can't say it, it's too wonderful - okay, yes, yes, we can say it - PRAAAAAAN (!!!!!). The year is, yes, 1942 and hence we are thick in the heat of the Indian Independence Movement. For once, some effort has gone not only into authentically recreating the historical context - pageboy hats, old cars, and saddle shoes abound - but also in presenting a believable portrait of oppression under the British Raj. The film's villain, the British General Douglas (Brian Glover, looking distinctly like he could be Colin Mochrie's dad), speaks in a caricatured raspy growl, but everything else is presented realistically and sans outrageous embellishment. Throw in one hunky freedom fighter, Shubhankar (Jackie Shroff), and one hunky tormented collaborator, Major Hisht (Danny Denzongpa), and the fun abounds. Throw in a secret plot to assassinate General Douglas, and the tension skyrockets! This film is really an enjoyable little number. Director Vidhu Vinod Chopra has an excellent eye for iconic framing, and the narrative has a sort of epic drive that makes even the most throwaway scene feel cataclysmic and gargantuan. Some moments - such as when Naren pursues Rajeshwari through the town's alleys, or Pran's arrest - aspired to sublimity. The film also made innovative use of Romeo and Juliet - indeed, this is the first time we've seen Shakespeare's lovers used in a Hindi film rather than the more typical Laila and Majnu myth. In 1942, the local theater company is performing a Hindi translation of Romeo and Juliet, and Naren and Rajeshwari naturally fall into these roles. We at the PPCC have been culturally indoctrinated into Romeo and Juliet, and so when this film passed all the same defining moments - the balcony scene, the secret marriage, the misinformation about their lover's death - it got an immediate emotional response from us. Even better, like West Side Story to racism, this film managed to successfully graft the classical Romeo/Juliet mythos over the much larger narrative about the freedom struggle. The balcony scene squeezed squishy feelings from our heart, and we relived the thousand other balcony scenes we've all seen and loved. PraaaAAAAAAAAaaaaAAAAAAAAAaan! Admit it, this is not the craziest thing we've caught Pran doing. Another interesting thing to note were the visual and aural allusions to the freedom struggle. Director Chopra often uses classical Western pieces in his background score, and here he makes heavy use of a certain recognizable Western piece to herald the British Raj's oppressive military presence. Which one is it? Why, it's Holst's Mars, God of War. Clever! Meanwhile, the scenes of Indian resistance are accompanied by the rousing anthem, Saare Jahan Se Accha, or a really phat, speedy sitar riff. A cunning visual reference to the anti-imperial struggle: Princess Leia buns! The performances were all fine. We should admit that another reason we were not so excited to see this was that we're not very interested in soft focus romances - and we certainly don't watch Anil Kapoor for his straightforward, vanilla hero roles. Nonetheless, he's effectively Mickey Mouse in this. Manisha Koirala does her usual ethereal moping thing. But the real stand-out of this film was Anupam Kher. See! 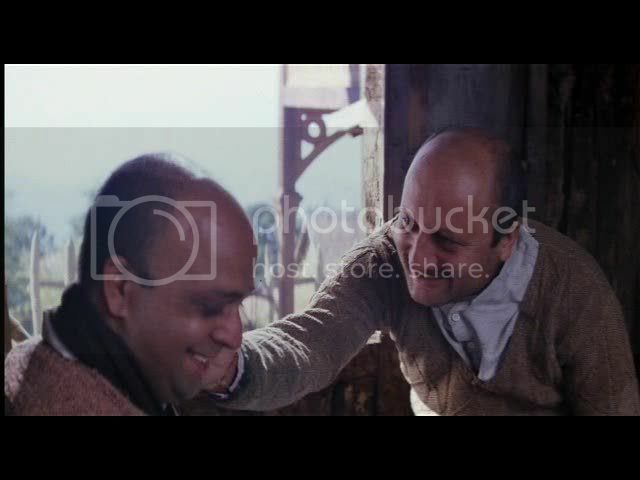 Anupam Kher is a good actor - a very good actor! Just give the man something to work with! In 1942, he is worlds apart from the usual grating comedy antics he was forced to do: here, his performance is extremely understated, quietly passionate, fragile and compelling. We found his scenes more moving than the lovers! Pran and Anil Kapoor sharing celluloid is almost too much for the PPCC to handle. Much is made of this being legendary music director R.D. Burman's final film. The oft-parodied Ek Ladki Ko Dekha (I saw a girl) is lovely (if overly familiar), but - and please don't burn the PPCC down for this - we actually didn't really dig the rest of the soundtrack. Plus, it was one of those relentless soundtracks with song after song after song - for once, we wanted to skip the songs and get back to the most excellent story! Guh, just look at that composition! "Jai Hind!" indeed! No, you can't throw out Shashi of your heart! Nahin! What is the world coming too. They're is room for both Shashi and Anil in my heart anyway. I haven't seen this movie, but it looks good. 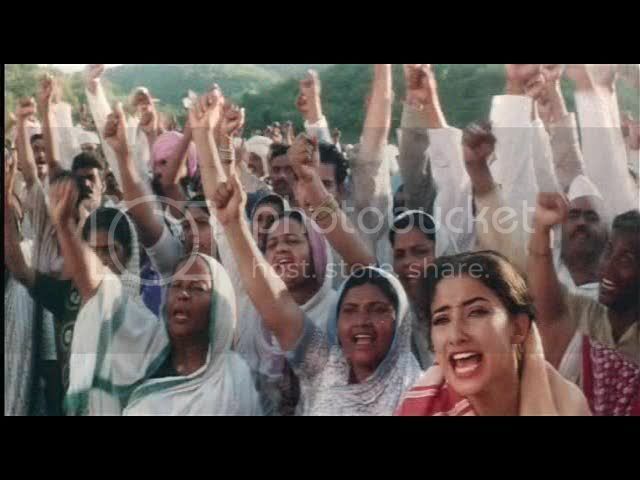 Manisha Koirala is such a good actress + you get Pran and Anil. I will tell you what I think after I watch it. P.S. I too am shaken by the sudden - of course SRK is at the golden globes and A R Rahman won one! Is it just me or was it yesterday that most people (non indian anyway) in America had no idea who these people were. I guess our "underground" passion for Indian cinema is not so underground anymore. It was a TP film...RDB's music made it a must watch. Jackie Shroff was quite good. 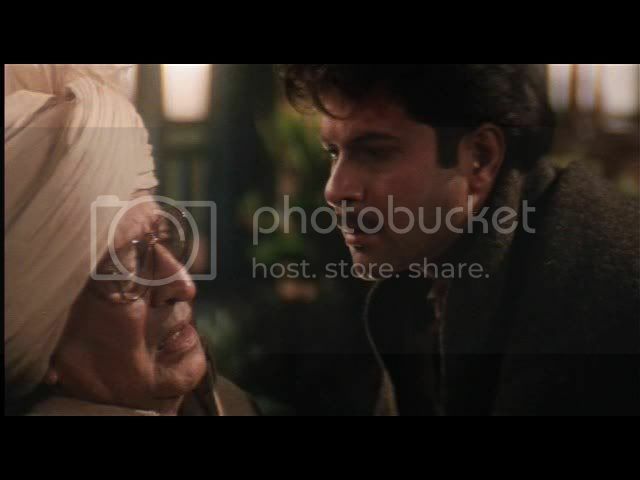 Anil Kapoor had that weird cap on, Manisha Koirala looked pretty, but can't recall a whole lot about it. I loved this movie a lot, too, but I suspect it was more because of the period feel, the lovely visuals and the songs. The soundtrack may not have been great but in the 90s context it was the best thing ever! Considering the awful stuff that passed for music in those days (with a few exceptions) and the terrible things put forth by RD himself, this was awesome - it was like having a slice of 70s in the 90s. Hey there! Thanks for linking to my blog. I can over to check yours out and I am all about it. However, I can believe you put the diss down on Madhuri. In my head, she is my girlfriend and we have a happy and healthy relationship where I work all day and then when I get home she does amazing dances and then I give her all my money and I don't even care how she spends it. eliza bennet - Yes, one down, Nayak to go! B&W was nice, wasn't it? No big nostril problem there, I hope. TCP - "TP"? Agreed that the cap was weird, but I appreciated the effort that went into costumes. Shweta - I should probably say here that I'm not a big fan of Manisha. She seems to have only one setting: moping! HEYYYYY, my favorite movie of all time! I screamed out loud when slumdog won yesterday and was wringing my hands in the air like my ANIL, the ammount of screaming i did when seeing my ANIL on stage and SRk being hilariously cool made my neighbours complain at my door! I am totally going to put a "I loved Bollywood before Slumdog Millionaire" banner up on my blog. And then in tiny letters add: "Even though I have not yet seen the iconic 1942: a Love Story." 'Ek ladki ko dekha' continues to be a favourite of mine. Not less, because we first heard a scratch track of the song near the FTII swimming pool, in the middle of the night, blasting from Vinod Chopra's car. (His then-wife was my classmate). The others didn't think much of its simplistic melody, but musically-challenged me, likes something I CAN SING. The sets at Film City were totally awesome too. Specially since we knew there was a blast coming up. And then VC wanted to reshoot the end, so they built the sets again. Or atleast part of. I can't imagine anyone else starring in this film. Anil, Jackie, Manisha, Pran... the casting is perfect! I know you enjoyed Anupam here - and I'd love to hear your take on why his comedy characters are all so awful. Is it a passive-agressive thing? Is he trying to undermine the time honored tradition of "Comedy Plot"? Banno. You have to tell us more doozy little gems like this! This is the kind of insider info I love - not gossip, really, just excellent context! I haven't seen this either and have never been particularly tempted, though I can't explain why. What is Shashi Pradesh going to do without you? I guess the rest of us will have to run things all on our own. But clearly SP is happy to have such a good relationship with Aniland. You can see similarity in songs of khamoshi,1942,HDDCS,Sawariya,Devdas and some of farah's great Dil chahta hai,OSO,Main hoo na................... etc. Rum - OMG I too haven't felt this excited about a film winning awards since Benigni won for Life is Beautiful! Ahh, cultural pride. Anonymous - I don't necessarily think songs need to be interwoven in a straightforward way - for example, I like Dil Se's jarring, dream-like songs - I liked how they were radically detached from the normal narrative. It's quite clever! 1942's songs seemed pretty standard to me in their placement within the story; neither incredibly contextual (it would have been more "interwoven", I reckon, if the theater had been putting on a musical, or Manisha's character was an amateur folk singer, etc) nor incredibly detached. For Burman, give me 70s Burman any day! Banno - Wow! Ooh, Banno, I LOVE hearing stories like that!! Ek ladki is a very sweet song - it and Tujhe dekha to yeh jana sanam from DDLJ are like my easy-to-parody, very cute anthems. Filmi Girl - The library one was my fave, I reckon - so cute! Haha, what a clever suggestion re: Anupam's awful comedy antics! If he really was being so subversive, I'd love him even more. He's such a talented actor! Honestly, I would have enjoyed 1942 if he had been the protagonist and Anil and Manisha the romantic subplot. Beth - Now that I've seen it, I can confirm that it's not really my thing. God, that soft focus... puhhh-leaze. If it's soft focus I want, I'll go back to Shashi Pradesh for that. With Anil, I want quirkiness SLEAZE. Oh, guilting me back into SP via my feelings of desh prem. I need to watch some Shashi, he's so neglected lately. Shamas - Do you mean similarity in picturizations or melodies/song styles? I haven't seen Khamoshi yet, but it's in my pile! Ek ladaki ko is directed by bhansali,kuch na kaho is directed by farah khan. BTW, I read your short story and enjoyed it... and have to ask, did Asad's drawled "Arre" come from a certain Shashi-licious actor? I didn't realize SLB did Ek Ladki! That would explain all that soft focus. ajnabi - Thanks for reading! 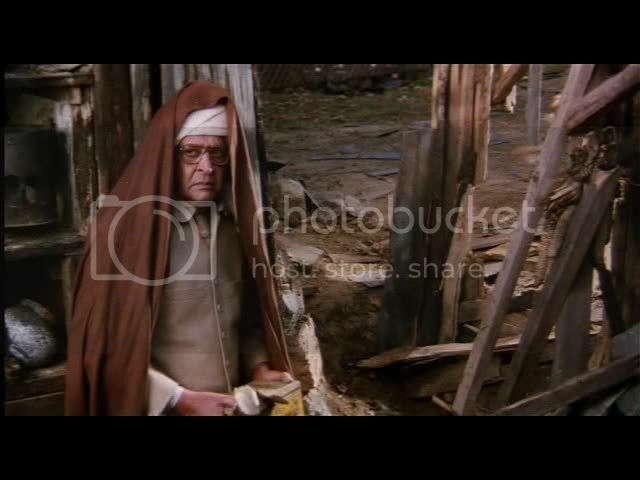 Although Shashi does indeed appear under a pseudonym in the story cycle, Asadullah Khan is actually played by Naseeruddin Shah in my head (and this is indeed a torturous reference since Naseer played Mirza Ghalib in a TV series, and I love Mirza Ghalib, and Mirza Ghalib's real name was... (drumroll) Asadullah Khan!). I really liked this movie. Everyone did their best in every department. Well made film.